George Graham Reviews Kila's "Luna Park"
Since the Chieftains sparked a revival of interest in Celtic music during the 1970s, the genre has taken a lot of interesting directions. While there still is an ostensible tie to traditional music, newer generations of artists have combined the instruments and rhythms of traditional Irish and Scottish music with influences ranging from rock to salsa to African to electronic. Groups and artists including Mouth Music, Shooglenifty, Eileen Ivers, Martyn Bennett, Solas and even Latin American star Ruben Blades have combined Celtic influences with unlikely combinations of sounds to create some fascinating musical amalgams. This week, we have an impressive new release by an Irish band who has been pushing the envelope of Celtic music for about 15 years, while singing almost exclusively in the Irish language. 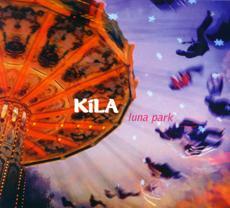 The group is called Kila, and their latest CD, their sixth, is called Luna Park. The group had its start in 1987, and was formed by three brothers still in their teens. Ronan, Rossa and Colm O'Snodaigh, and piper and whistle player Eoin Dillon after going thorugh various personnel changes eventually recruited two other brothers, Lance and Brian Hogan, along a fiddler, Dee Armstrong, making for one of the larger-sized Celtic groups as a septet. While staying with the use of the Irish language, they have looked far and wide for the musical ingredients they added to their stew, everything from African township jive, to Eastern European and Indian sounds, a hint of tango, and even some American country music in the form of a twangy guitar, on this new release. The result is a sound that many people find completely defies any attempt to place it geographically. The Gaelic language, with some of its guttural consonants might lead some to believe that it might be Arabic or Hebrew, or an African language. The group can start with a jig or reel, and wind it up into a dervish like intensity, which when added to music, often written in minor keys, evokes Turkish or Middle Eastern sounds. Some of their earlier work has been compared to African American Georgia sea-island music. And while the pennywhistles, bagpipes do remind listeners of the Celtic origins of the music, for the most part, Kila really does create what could fairly be called World Music. With seven group members, Kila's sound is often big and intense. Not quite the assault on the senses as the Riverdance production, but nevertheless, usually at a much higher energy level than is typical even for lively Irish jigs. And that energy is achieved for the most part with minimal electric instrumentation. But the instruments they do bring in are as eclectic as their stylistic mix: African drums, trumpets, marimba, clarinet and saxophone, and percussion from India, and South America. And on one tune, they forsake all the instrumentation and perform a track a cappella. Kila is surely one of the most fascinating Celtic groups on the scene. With seven members including two sets of brothers, along with unrestrained eclecticism and intense energy level, this is a group whose music will probably wow you on first hearing. Many may be unable to tell that this is indeed Celtic group from Dublin. Their combination of instrumentation and influences is remarkable even in day in which Celtic fusion is proliferating. About the only criticism I would offer is that the band just can't seem to turn things down much. There are two quiet pieces on this CD, but for the most part, it's music that starts out in high gear and then goes up from there. And with some lengthy pieces, it can get to be a bit wearing to the listener at times. There are instances in which the group does tend to go on after they have made their musical statement, though with their elaborate arrangements, I really would not call this so much a jam band. And that intensity carries over into the recording quality. We'll give the CD about a B-minus for sound that pushes even the quieter passages to be loud all the time. This is an all too common malady on CDs these days, but it does accentuate the group's only significant flaw. The band recorded the CD in a studio they set up themselves for the purpose, and brought in veteran British engineer Mick Glossop for the mix. Celtic fusion is one of the areas of music with a lot of creative minds applying their imagination. Kila, on their new CD, further raises the bar for mixing Celtic with all kinds of unlikely ingredients. The result is a very impressive recording.